OHA’s decision in Redhorse Corporation, SBA No. VET-263 (2017) involved a GSA RFQ seeking transition ordering assistance in support of the Network Services Program. The RFQ contemplated the award of a task order under the GSA Professional Services Schedule. The order was set aside for SDVOSBs under NAICS code 541611 (Administrative Management and General Consulting Services). The GSA contracting officer did not request that offerors recertify their SDVOSB eligibility in connection with the order. After evaluating quotations, the GSA announced that Redhorse Corporation was the apparent awardee. An unsuccessful competitor subsequently filed a protest challenging Redhorse’s SDVOSB status. The SBA Director of Government Contracting sustained the protest and found Redhorse to be ineligible for the task order. In two recent decisions, the Government Accountability Office (GAO) denied protest grounds challenging the ability of contract awardees to satisfy government requirements related to cybersecurity. This posting analyzes those decisions and their implications for contractors. The General Service Administration’s Alliant governmentwide acquisition contract (GWAC) had an outstanding year helping agencies achieve their mission through a fast, flexible, and reliable acquisition vehicle. 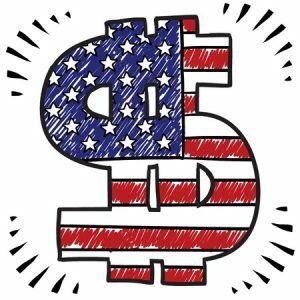 Agencies obligated $2.93 billion dollars to Alliant during FY15, marking Alliant as the largest utilized single GWAC in GSA history by dollar value. Alliant is GSA’s premier enterprise GWAC, providing flexible access to customized IT solutions from a large, diverse pool of industry partners. Alliant allows for long-term planning of large-scale, complex program requirements. Since contract inception, more than 63 agencies have used Alliant and awarded an estimated $22.8 Billion in task order value. Seven agencies used Alliant for the first time in FY15. This steady growth can be attributed to numerous factors. For example, approximately 870 federal acquisition and program professionals have received the Alliant GWAC Delegation of Procurement (DPA) training – 248 contracting officials in FY15 – a 23% increase. During FY15, 96 Statements of Work (SOWs) were submitted for review, representing a 13% increase. The top three agencies utilizing Alliant, in terms of obligated dollars, are the Air Force at $3.49 billion, the Department of Homeland Security at $3.00 billion, and the Army at $2.83 billion. The Department of State comes in at a close fourth at $2.62 billion. Currently, the firm SAIC leads obligations – over $2.12 billion spread across 44 task orders. Booz Allen Hamilton Engineering Services follows with $881 million across 12 task orders, and Lockheed Martin follows with $853 million across 21 task orders. As pre-competed vehicles, GWACs can streamline the acquisition process, which naturally leads to saving time and money. Alliant consists of 57 prequalified contractors. To date, 51 out of 57 primes have received awards. 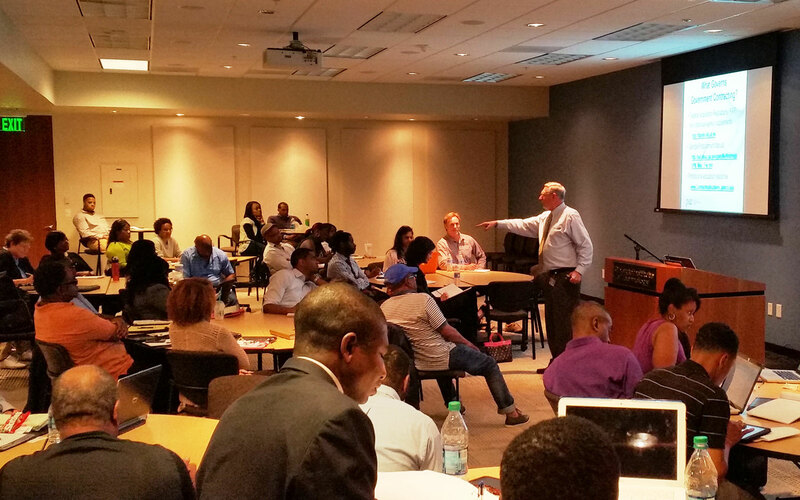 GSA’s Enterprise GWAC division recently invited representatives from each of the 57 Primes to participate in Alliant’s twice-a-year Program Management Review (PMR). The event spans two days and allows industry to interact with government and participate in collaborative program updates and breakout sessions. Success on projects through Alliant is a three-part partnership – GSA, the procuring agency, and the company performing the work under the task order. 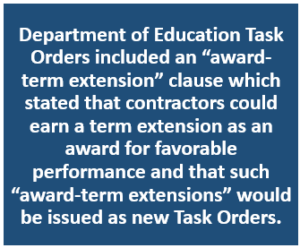 A contractor was eligible for award of a small business set-aside task order because the contractor was “small” as of the date of its task order proposal–even though the contractor outgrew the size standard by the time the task order was awarded. 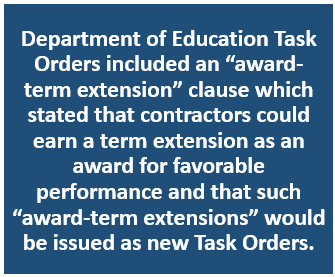 In a recent bid protest decision, the GAO held that a contractor may qualify for the award of a set-aside task order based on the date of its initial proposal, even in cases where the agency is prohibited from taking small business credit for the award. The GAO’s decision in Research and Development Solutions, Inc., B-410581.2 (Jan. 14, 2015) involved a Navy task order solicitation for technical and engineering services. The solicitation was issued as a small business set-aside under the SeaPort-e IDIQ contract vehicle. The General Service Administration’s Federal Supply Schedule (FSS) is supposed to be a way for agencies to streamline procurement. However, achieving the desired efficiency requires that the Government buyer use the right contract vehicle for a given requirement. If the Government uses the wrong schedule—or a contractor proposes to provide goods or services that are not available under its schedule contract, and the agency fails to perform a careful evaluation—litigation may effectively eliminate the desired efficiencies. A recent GAO decision, US Investigations Services provides a good example of how thing can go awry. The FBI issued a task order for services in connection with its National Name Check Program to the awardee using the awardee’s FSS contract. Under the task order, the awardee would research FBI files, assist in responding to FOIA requests, and support the agency in making national security classification determinations. The protester raised several protest grounds, and GAO sustained one: the labor categories required to perform the task order were not in the awardee’s FSS contract. The agency’s solicitation included four labor categories, and the awardee proposed a single labor category from its FSS contract to satisfy the requirements of three of the categories. GAO compared the labor categories required under the solicitation with the description of the awardee’s category and determined “that the duties, responsibilities and qualifications of the types of employees solicited by the agency are not encompassed within” the awardee’s labor category. The agency was looking for personnel with in-depth knowledge of FBI policy and functions, as well as experience in records management, declassification review, and paralegal services. The awardee’s labor category focused on general aspects of program management, such as developing business methods, identifying best practices, and creating and assessing performance measurements.